Imagine if your Twitter account was so trash that federal investigators were called before Congress to publicly dismantle your tweets. For President Trump, that nightmare scenario became a reality on Monday. But that’s not what either man said—at all. The directors only testified that Russia didn’t change tallied votes in swing states, not that Russia didn’t have some influence on the “electoral process.” The latter is much more wide-ranging and would include everything from “fake news” and misinformation campaigns to hacking and leaked emails. In fact, Comey said during the hearing that Putin clearly wanted Clinton to lose. Comey and Rogers—who, of course, had been sitting there the entire time and didn’t know about the tweet—had to hear it a few times before denying Trump’s characterization of their remarks. 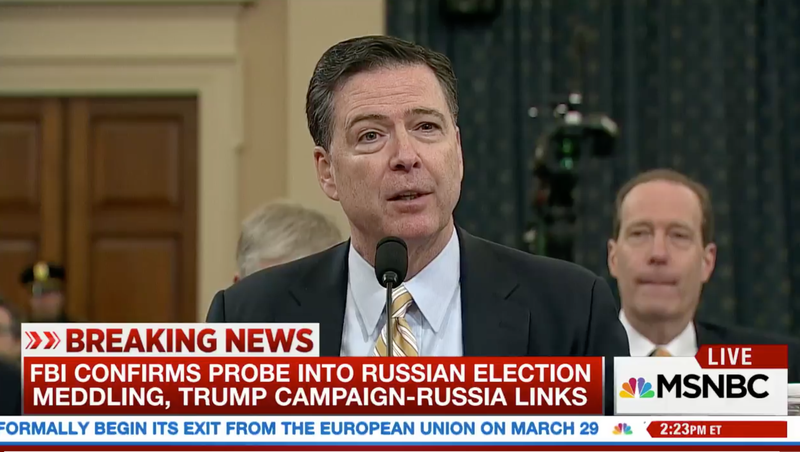 “It certainly wasn’t our intention to say that today, because we don’t have any information on that subject,” Comey told Himes. Does that make it fake news? The @POTUS account’s timeline is filled with clips from the hearing cherrypicked to flatter Trump and bolster his narrative that Russian electoral influence is a conspiracy theory, but the head of the FBI just testified under oath that his Twitter account was trash. When you’re thin-skinned enough to post deceptively edited clips with misleading captions, that’s gotta hurt. If only Bernie had been there.